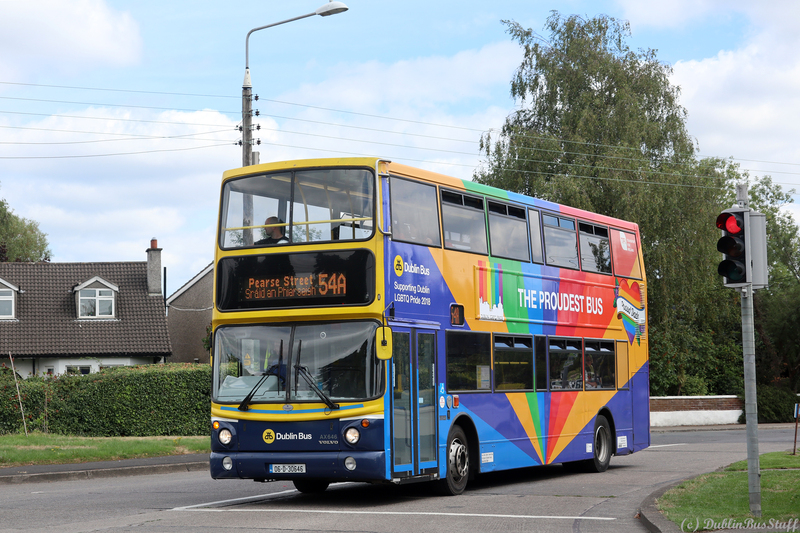 Donnybrook's Proud Dad's liveried AX646 is seen operating Route 54A on Fortfield Road on the 4th August 2018 (click on photo for larger version). Finally! AX646 had been a bit awkward for me to catch. Since it has been in this livery, I haven't been able to make Dublin much and when I did it wasn't in operation. I had felt it would probably be out of the livery by the time I caught up with it, but thankfully the wrap is still in place. 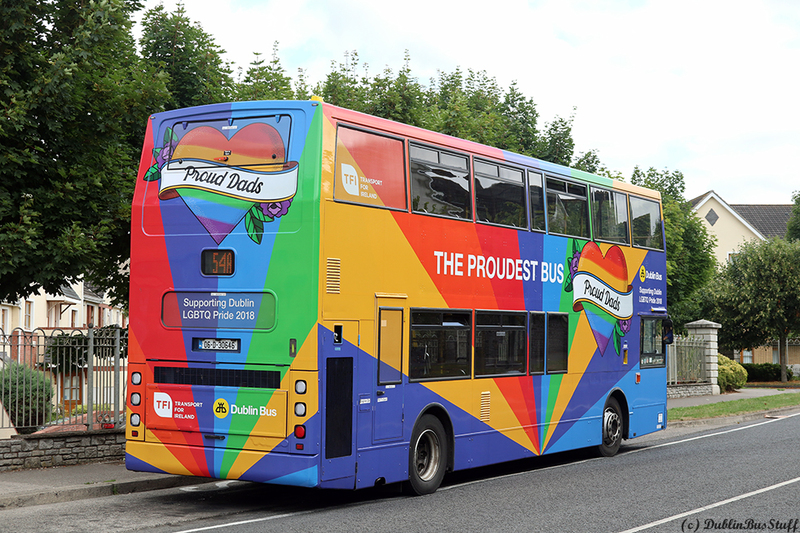 The proud dads concept was really a heartwarming idea from Dublin Bus. AX646 was used by fathers whose children had recently come out to them, who picked up their children in this bus and brought them to the parade to show how proud they were of them. If you haven't seen the video it is worth a look here. It really is a great story. Two other buses, AX647 and AX488 were painted in a similar wrap for use in the Pride Parade itself (see here). 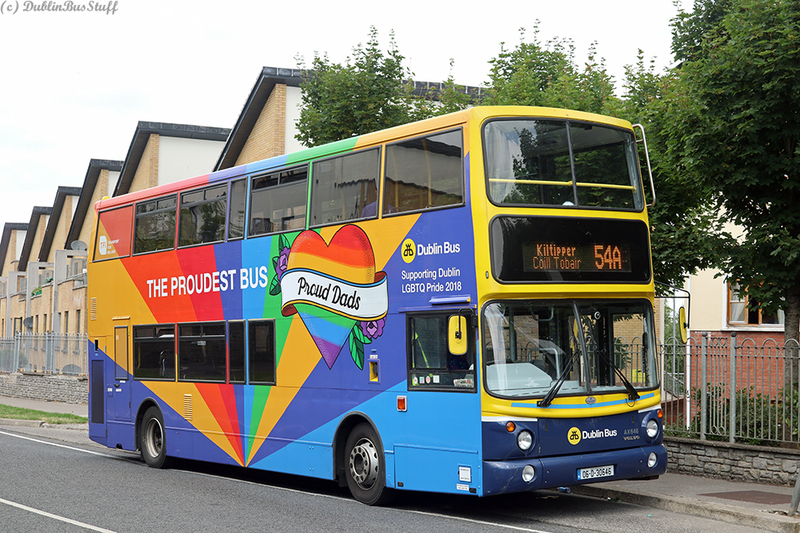 These three buses are the latest in Dublin Bus' long association with the Pride Parade in Dublin. A rear shot of AX646 in its Proud Dads livery at the Kiltipper Terminus of Route 54A on the 4th August 2018 (click on photo for larger version). Donnybrook's AX646 is seen in its Proud Dads' livery at the Kiltipper Terminus of Route 54A on the 4th August 2018 (click on photo for larger version).